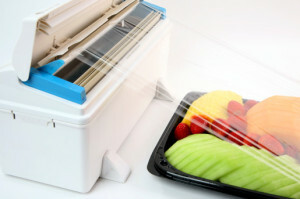 The new Wrapmaster Dispenser from Western Plastics is here to make your life easier. You no longer have to worry about unsanitary cutterbox cartons, corrugated cartons, or blades to dispose of. Refill rolls are easy and quick-loading. The steel cutting blade is concealed to improve safety and sanitation. This dispenser is designed to keep foil and plastic cuts clean and tangle-free every time. Refill rolls for film and foil come in 12″ and 18″ sizes for a variety of uses.